The nutmeg tree originates in Banda, the largest of the Molucca spice islands of Indonesia. Nutmeg is a spice made from the seed of the nutmeg tree. The nutmeg tree produces not one spice, but two. Mace is also derived from the nutmeg fruit. The nutmeg can either be dried and left whole and packaged for grating, or dried and grated fresh. Nutmeg does have a sweeter more delicate flavor and fragrance than mace. Nutmeg is used in both Western and Chinese herbal medicine. It is most popular as a spice in food and drinks, and is also used in cosmetics and soaps. Like many other spices, nutmeg is one of those fragrant additions to food that brings a little kick of warmth and curious complexity that, once tasted in a dish, can’t be done without. 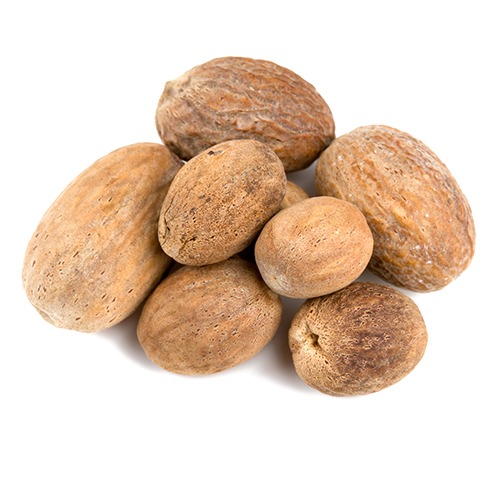 Nutmeg is often used in baking recipes for cakes, cookies, and in savory dishes such as soups and stews, sausages, meats, soups, fruits and preserves. And lets not forget about the popular holiday beverage of eggnog which just wouldn’t taste the same without a sprinkle of nutmeg. Nutmeg works well with allspice, cardamom, cinnamon, cloves, coriander, cranberries, cumin, ginger, pepper, sugar, thyme, and vanilla. You can use nutmeg in savory dishes like asparagus, beans, cabbage, eggs, fish, lamb, onion, carrots, pumpkin, potatoes, sausage, seafood chowders, veal, and yams, as well as coffee drinks. As a tropical tree, nutmegs like plenty of heat, but are happiest if they grow in bright areas with light shade when they are young. Nutmeg trees begin bearing fruits sometime between the ages of 7 and 9. Once the tree begins producing fruit, you can expect the husks to begin splitting, signaling that the fruit is ripe. Nutmeg is harvested from January to March and June to August.